Sister # 4 went antiquing for me last week. 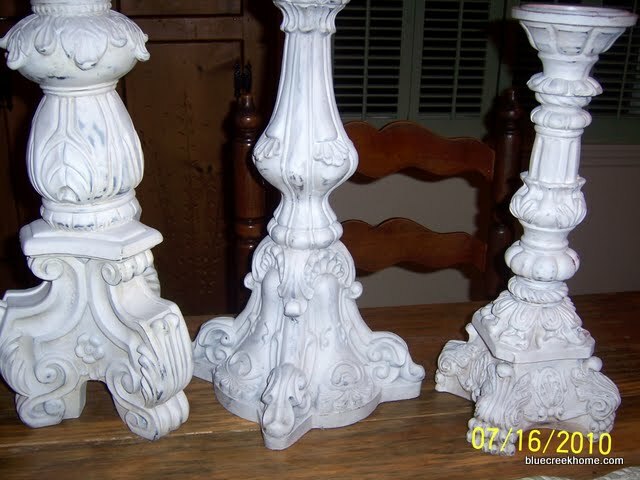 She called to tell me she had found a set of three large candlesticks at an antique mall close to her. I have four now, but I wanted to add some more to the mix. She went after work and grabbed them up for me and even got a discount!!! I don’t have them yet, but she sent me photographs. They are some type of heavy plaster. The largest one is a whopping 29” tall. Are these bases incredible or what? As Paula Deen says, “I can’t hardly wait”…to get them here! I am joining the linky parties at “Southern Hospitality” and “Coastal Charm”. and “Underneath The Table & Dreaming”. I showed you this pretty piece of decorative crown molding a few days ago. but no one got it exactly right. Don’t laugh at my construction! I used bits and pieces of wood we had on hand. And, the wood we had on hand was not the perfect pieces! But, I made it work. The hardest part of this project was cutting the pieces to fit the contour of the ends. It is upside down here. The crown molding will hide those odd pieces at the top. G-Man doesn’t like the fact that I love power tools so much. He always wants me to tell him when I am using them. and my trembling arms trying it on for size. As you can tell by now it’s a bed crown and I will show you the end results soon. 1) Your sister hooked you up! Gorgeous candlesticks! 2) Your booty is NOT big! 3)Your bed crown is going to look amazing! Can't wait to see it finished. Rhonda, can't wait to see what you do with those big candlesticks. Wonderful find. Looking forward to seeing the bed crown project finished. Oh, I'm excited to see the finished bed crown project! And, those candlesticks are impressive! I have seen the finished product and it is gorgeous!! We definitely built some upper body muscles hanging it though :-) Love you and your talented B.O.B. Those candlesticks? Are they wood? They look beautiful!! Are you planning on giving them a make over? Oh boy, I do love 'em. Lucky you. Love what you're doing with your bed too. I love those candlesticks...what a great sister!! The bed crown is going to be wonderful. I cannot wait to see how you arrange it. Wow! I have always wanted one! The bed crown! I have a b-o-b already...duh;)! I can't wait to see it all dressed up...it is going to be YUMMY! Loving the candlesticks...just more things for you to pack up and send to me...so sweet of sis to think of me;)! I hope you and that precious grandbaby had a wonderful weekend! 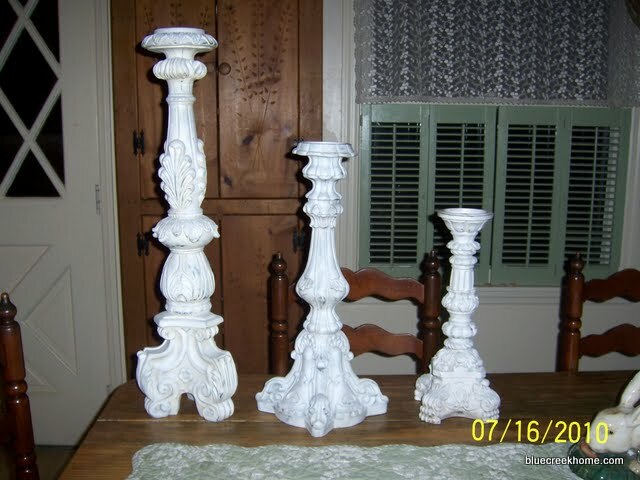 I have two candlesticks like the one on the left side of the pic and have really enjoyed using them for years...found mine at an antique store in Bay Saint Louis...love that little town! That bed crown is looking good...great idea! I love, love, love those candle sticks!!! Those candlesticks are gorgeous! The bed crown is going to look amazing, be careful up there on that bed!!! Can't wait to see it!!! Also loving the new candlesticks! That is going to look absolutely GORGEOUS when it's finished! 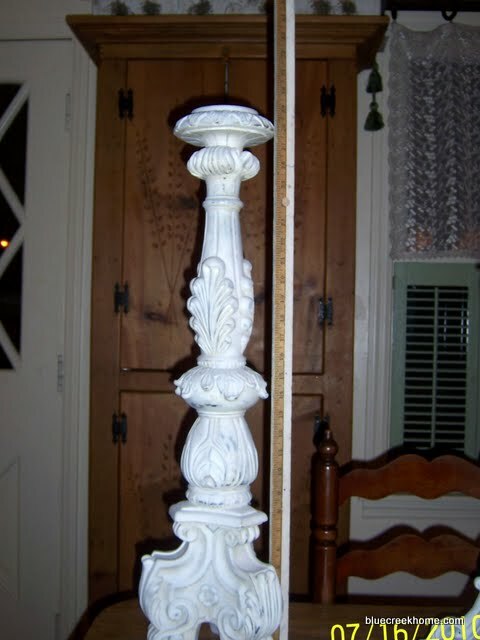 I have been on the look out for candlesticks like these myself. I have a great vintage/antique collection and started one for my mom, and now my sister wants to join in the fun. I rarely buy retail, but Restoration Hardware has some great looking wooden ones right now. Enjoy your beauties! What awesome candlesticks! Absolutely gorgeous!